Following on the success of their first two real-money slot machine games for the mobile phone platform, Slotland.com has launched yet another mobile slot machine. 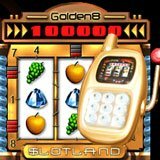 The Golden 8 has long been a favourite at the popular slot machine website and now makes its debut on their new WAP gambling site for mobile phones and PDAs. The Golden 8 mobile features a bonus round triggered by spinning Blue Diamonds. Bonus round bets are taken from the previous spin so a common strategy is to maximize bets when you’ve collected five diamonds and are waiting for the sixth to trigger the free bonus round. While many of Slotland.com’s regular online players occasionally play their favourite slots on their phone, the pioneering mobile entertainment provider is finding the mobile games appeal to quite a different kind of player. Slotland.com now features three unique games in its mobile suite and eight different slot machines plus video poker on the web site. Every six weeks or so, a new mobile game is added – about as frequently as Slotland’s famous progressive jackpot is hit for $150,000 or more.